This past season has been filled with good vibes and great tunes. 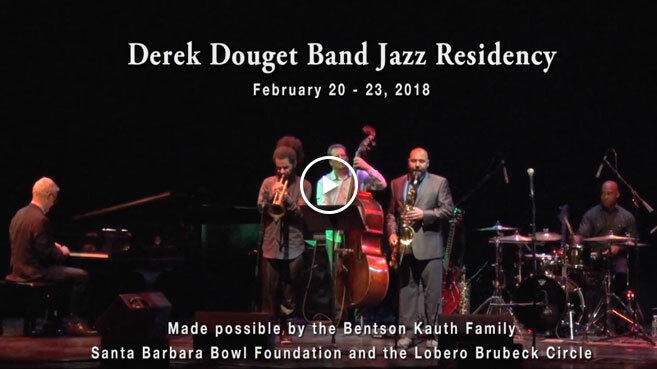 The Brubeck Circle Jazz Residency with New Orleans jazz musician Derek Douget hit all the right notes. The week after Mardi Gras, bandleader Derek Douget assembled an impressive lineup of prestigious music educators from the New Orleans area and headed up to Santa Barbara to spend a week visiting local schools to hold clinics for jazz student. They sat in with different jazz ensembles across Santa Barbara County, tailoring each class to best benefit the students’ skills, from Jr. High jazz class to semi-regular college-age performers. These masterclasses were fun; the guys were generous and open to sharing insights from their own careers–from everything from tips on chord choices to being confident in their playing, and perhaps most importantly, showed what it’s like to make a living as a jazz artist and keep performing at a high level. Douget and his band topped off their visit with an unforgettable performance on February 23, 2018 sharing the stage with high school jazz artists, The Jazz Villains, and closed the evening in a second line parade around the auditorium that had the crowd on its feet (starts around 12 min). The Lobero is dedicated to enhancing music education through our youth programs and is reliant on the generosity of supporters like you. As our fiscal year nears its end on May 31, we look for your help. Please consider making a gift today to keep inspiring young musicians. Share the post "Good vibes and great tunes"